How Much Can I Air Down? 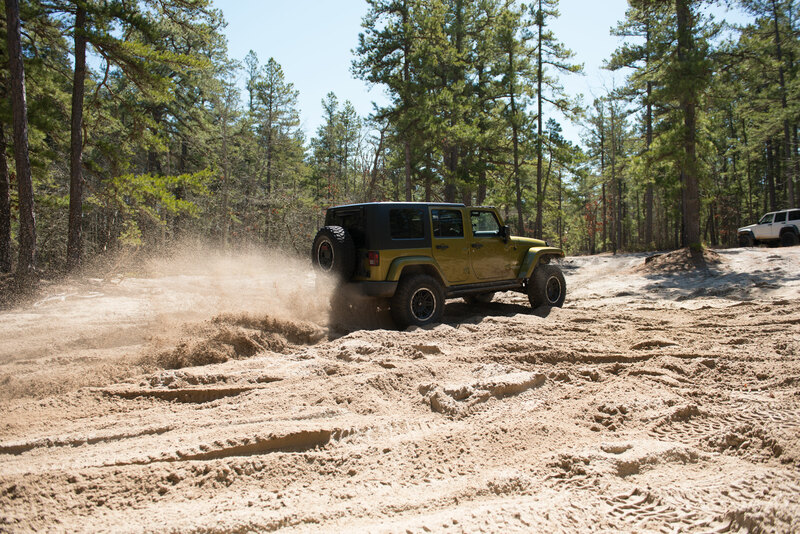 Airing down your Jeep Wrangler tires while off-road can provide better traction. Find out how much you should air down while wheeling. Almost everyone knows that it's important to keep your tires properly inflated, however not many people know when to air down. Airing down your Wranglers tires means you remove air from your tires in order to provide better traction, smoother ride, and help prevent punctures while off-road. There are quite a few factors that dictate when you should do this and what pressure you should run. Airing down can help in most off-road situations with some good examples being sand, deep snow, and rock crawling. When your Jeep tires are properly inflated they provide a flat contact patch that will provide excellent traction on pavement, however when you venture off-road you may find yourself needing more traction. If your tires are overinflated not only will you have reduced traction due to a reduced contact patch, the ride will also be stiffer and you will feel every bump. When you air down your tires you are increasing the contact area, how this works is that as the pressure gets lower the more rubber touches the ground at a time. Not only do you increase your traction it provides a smoother ride by allowing soft tires absorb the impacts rather than transmit it like a very stiff tire. Also, going along with the softer tire concept, you reduce the risks of punctures because your tires can be pushed in more rather than being a solid surface that can be stabbed through rather easily. One of the biggest possible issues is that if your pressure drops to low on standard Jeep rims you run the risk of unseating the bead of the tire. This however can be avoided by finding the proper pressure for your rig and particular off-roading environment, or by installing beadlock wheels. Another thing to take note of is that tires should always be inflated to the proper pressure for driving on roads, if your tires are underinflated you run the risk of serious injuries or damage. Not only is it not safe but it can damage the inside of your tires due to overheating in addition to killing your fuel economy. To avoid any inflation issues you will need to keep some method airing up your tires with you while off-road, this can range from a small DC air pump to a canister of CO2. Another possible drawback could be that you lose small amounts of ground clearance as you air down. You could also wear your tires faster if you fail to inflate them before driving home. There is no set pressure that applies to every Wrangler. Weight, tire size, rim size, rim type, ground clearance, environment, and many more. These are all variables that affect the pressure that you can run, one way to figure out what to run is to air down a bit at a time and test it. The issue with this is that you run the risk of unseating the bead and you could damage something or getting stuck on the trail, generally a safe pressure for most regular wheels is 15 psi although your results may vary. With beadlocks you can run extremely low pressures without having to worry about unseating a bead, some people run between 5-7 psi and others may run from 1-4 psi. How low you can go on beadlocks has a lot of variables. If you are going to be doing serious off-roading with a dedicated rig, it may be practical to invest in a set of beadlock Wrangler wheels. This special type of wheel allows you to run extremely low tire pressures without unseating the bead. Beadlock wheels are not like normal wheels, your regular automotive wheels use tire pressure to hold the bead against the inner rim allowing them to stay firmly together. If conventional wheels are aired down too much you will probably unseat the bead, this can be extremely difficult to fix off-road and can cause damage to your wheel or tire. There are several different types of beadlocks including standard, internal, and double. Standard beadlocks use a ring that bolts to the rest of the wheel to lock the tire in place, this is usually only on the outward facing side of the rim because it is typically the side that comes unseated while off-roading. Double beadlocks were made popular by the Humvee, these 3 or 4 piece wheels bolt two sides together and have an internal support piece that allows for both sides of both beads to be firmly locked in place. Internal beadlocks are like a stiffened and reinforced inner-tube. As the internal beadlock inflates it applies pressure against both beads of the tire, this causes it to act like a double beadlock rim.